Top 10 New Things for 2017 at Disney World, Universal and All Orlando Parks! Last year was an incredible year for theme parks in Central Florida. With new dark rides like Frozen Ever After and Skull Island: Reign of Kong, new coasters like the Mako hyper coaster and the spinning Cobra’s Curse, to new dining and shopping options such as Toothsome Chocolate Emporium and the impressively expanding Disney Springs, 2016 is a hard year to beat. It looks like 2017 might be up to the challenge through! With new rides, updated favorites, new places to stay, more places to eat, entirely new lands and even a brand new park, this year is shaping up to be one the best in recent history! We still have quite a few years before we see a Star Wars land or Nintendo World, so for now, let’s sit back, and revel in the top ten new things this year is going to offer. While the Kraken coaster has been at SeaWorld Orlando for years, terrifying and delighting guests with its 140 foot drop and speeds up to 65 mph, it’ll be receiving a brand new upgrade this year. 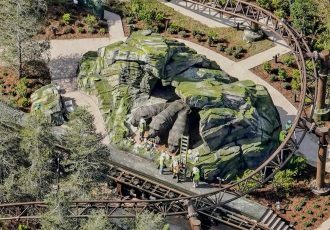 A custom digital overlay with uniquely designed headsets, fully integrated both mechanically and electronically into the coaster train will deliver a new one-of-a-kind adventure. Riders will have the option to wear the VR headset and experience the coaster in a completely new way. 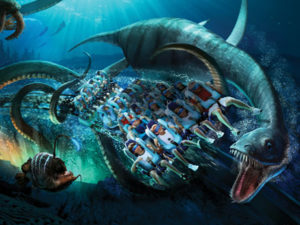 You’ll ride underwater alongside sea creatures inspired by extinct and legendary animals of the past, including the mighty Kraken, adding an entirely new story and layer to this already incredible ride. MagicBand 2 is the long-awaited update to the wearable part of the MyMagic+ system. Some special editions of the new version have already been released, but the full rollout is still underway. This new version is very much like the original, with one distinct difference. You can now remove the middle part of the MagicBand, the part that carries the actual RFID, and place it in another band without having to reprogram it. This means you can buy additional bands at a cheaper cost and without having them programed. What may be even more exciting are the MagicKeepers coming out as well this year. MagicKeepers will be other items that can also carry your RFID portion, or “removable icon,” as Disney calls it. These items will include things like keychains, themed lanyard clips with a carabiner, and other accessories, perfect for guests that would rather not wear a rubber wristband in the Florida heat all day! MagicKeepers will be sold without a removable icon so you just need to add yours out of your MagicBand 2 and you’re golden! 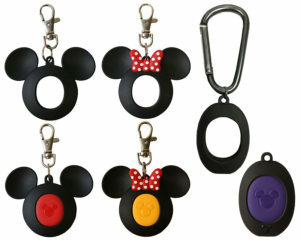 This will open up a whole new world of MagicBand accessories and customization options! 2017 will see the first year in what may become another annual festival at Epcot. 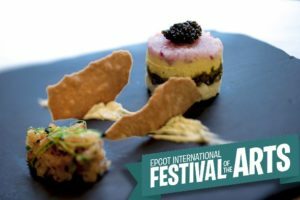 The International Festival of the Arts will combine visual, culinary and performing arts for six weekends, offering visual art displays, unique food offerings, and live entertainment throughout the park. During the event guests will enjoy Broadway talent in concert, performing songs from award-winning shows like ‪The Lion King‪, Newsies, and Aladdin. Art exhibits provide an up-close look at works from iconic Disney Legends Mary Blair and Herb Ryman among others. And it wouldn’t be an Epcot festival without the food. Foodies can feast on delightfully themed fare featured at special food studios. Event will run Fridays through Mondays, January 13th through February 20th. The complete re-invention of Downtown Disney into the premiere shopping and dining destination, Disney Springs, continues with several new restaurants opening in 2017. 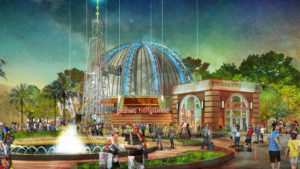 Planet Hollywood Observatory will be a complete re-imagining of the famous restaurant, with an all new menu including selections by celebrity chef Guy Fieri. The Edison will be a lavish “Industrial Gothic”-style restaurant with live entertainment nightly. The steamboat shaped restaurant Paddlefish, formerly known as Fulton’s Crab House, is getting a bow-to-stern transformation. And The Polite Pig will be a sister restaurant to The Ravenous Pig of Winter Park, FL, offering wood-fired smoked and grilled foods as well as locally-brewed beers on tap. It’s not often we see somehting new coming to a Disney water park, let alone something that sounds this awesome! Miss Fortune Falls will be a family-style raft ride, and at two minutes, it will be the longest ride at any Disney water park! 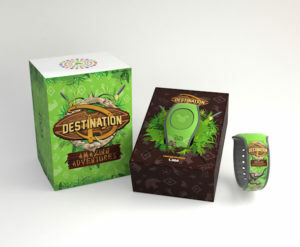 Guests will splash through a series of whitewater rapids in hopes of discovering the spoils of treasure hunter Capt. Mary Oceaneer. 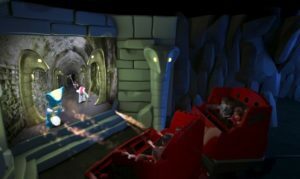 This new ride will be located near the park’s existing Crush ‘n’ Gusher and is set to open in March, after the park’s yearly refurbishment is complete. It’s certain to quickly become a new guest favorite! 2017 may see the start of the long awaited nightime show for Animal Kingdom, Rivers of Light. Originally scheduled to open last year, the show was quickly replaced with a temporary Jungle Book presentation while the bugs were worked out. 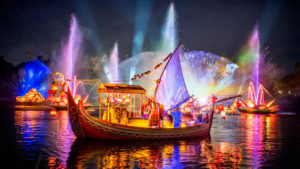 Plagued with technical (and apparently story) issues, the show incorporates music, special effects, water projections and boats featuring a story based on animal folklore. It’s meant to celebrate the natural world and will utilize unseen footage from Disneynature documentaries. There’s still no official start date announced for the ambitious new show, but individual elements are being tested on a nearly nightly basis, proving it will (someday) be starting (hopefully) soon! 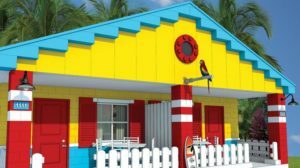 LEGOLAND Beach Retreat features a village-style layout with 83 beach-themed bungalows adding 166 more rooms to an ever expanding LEGOLAND Resort. The bungalows will be separated into sections with their own outdoor play area within the view of every cabin’s front porch, allowing parents to kick back and relax while keeping an eye on their kids. Like the LEGOLAND Hotel, the Beach Retreat will offer free breakfast buffet, early park admission, and its own swimming pool. Of course the rooms are designed with whimsical LEGO decor inside and out, featuring LEGO surfboards, parrots, and lots of other little touches! They’re already accepting reservations for April, when the resort is scheduled to open. As if that weren’t enough for LEGOLAND this year, they’re also opening LEGO Ninjago World at LEGOLAND Florida (Now Open!) This new land themed to the popular Ninjago line of toys, movies, and TV shows will feature hands-on outdoor activities and a new ride that combines 3D animation, special effects and an interactive technology that is exclusive to LEGOLAND parks. Riders will be scored and collect points during the four-minute ride by using hand gestures to conjure up magical spells that interact with screens and effects throughout the ride. Like a video game, the ride will even have a leaderboard wall near the exit, displaying the high scores for the day! 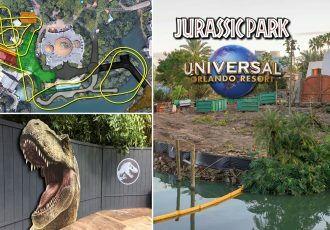 This new attraction at Universal Studios Florida is set to open April 6th, and while many theme park fans are still torn on whether or not it’s a good addition, I think almost all of us can agree that it was time for Twister: Ride it Out to get out. 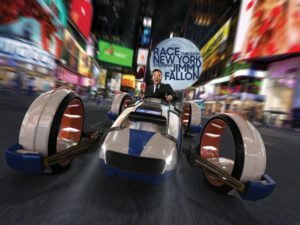 This new ride will feature a flying theater that holds 72 guests, as they fly through New York in a 3D adventure that will incorporate many of Fallon’s characters from The Tonight Show as well as include famous New York landmarks. Even if you’re not a fan of Jimmy Fallon (or are sick of 3D rides at Universal) at the very least it’s nice to see the New York area of the park expanded and more unthemed soundstages finally get covered up. The ride building is built to look like NBC Studios in 30 Rock where The Tonight Show is filmed, and the queue will resemble the lobby of Studio 6B. After the ride guests will be able to see memorabilia from the iconic history of The Tonight Show, making this an exciting addition to the park. This long-awaited immersive themed land in Disney’s Animal Kingdom will include two new rides, a restaurant and at least one gift shop. Announced more than five years ago, the new land only broke ground two years ago and Imagineers have been working tirelessly ever since to bring James Cameron’s vision of an alien world to life. 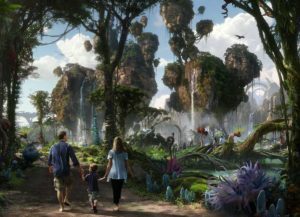 The land will feature a storyline that takes place a few years after the events of the 2009 hit film “Avatar,” where Pandora has recovered from the war with humans and is now welcoming guests. Festive, colorful buildings reuse the ruins left over from the war. Guests are transported to Pandora by Alpha Centauri Expeditions, who is offering tours of the now peaceful planet. The land will feature two brand new attractions. Flight of Passage is rumored to be a simulator ride similar to Soarin but with smaller individual cabins that all share a large screen, like The Simpsons Ride at Universal. 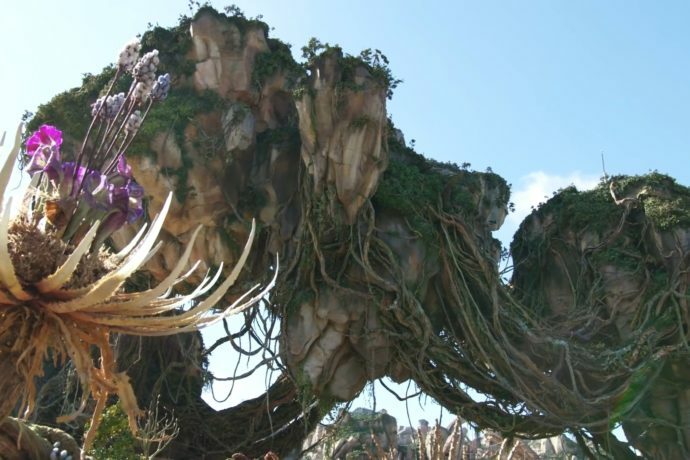 It will be in 3D and take guests on a wild ride atop a Banshee, the flying dragons of Pandora. 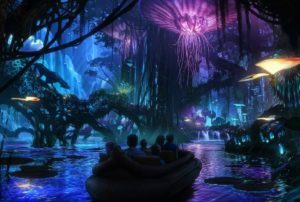 The other ride, named the Na’Vi River Journey will be a more relaxing dark ride through the jungles of Pandora filled with bioluminescent plants, AA figures, and state of the art projections similar to Pirates of the Caribbean ride in Shanghai. Both rides will be housed within a huge show building beneath the majestic floating mountains of Pandora. 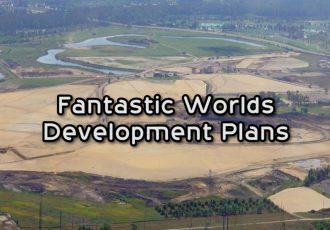 Regardless of your feelings on the film series, this new land promises to offer a fully immersive and incredible theme park experience. Volcano Bay will be the first water park that Universal builds from the ground up. (It will be replacing Wet ‘n Wild which closed for good recently.) 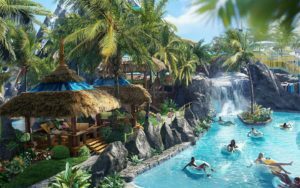 Spanning 28 acres, Volcano Bay will transport you to a lush, tropical oasis inspired by the Pacific isles. The centerpiece of the park will be a 200-foot-tall volcano named “Krakatau”, and many of the parks centerpiece attractions will be housed within this massive volcano. 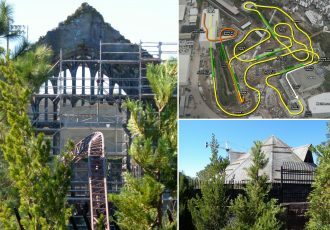 There will be 18 attractions in four themed areas. 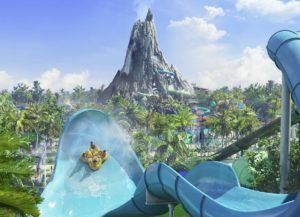 These will include a multi-directional wave pool with sandy beaches, a peaceful winding river, twisting multi-rider raft rides, speeding body slides that drop from the top of the volcano into the waters below, and a state-of-the-art water coaster. Even more intriguing is that Universal claims there will be no waiting in lines at Volcano Bay, offering instead the Tapu Tapu wristband that alerts you when it’s time to ride. This way you can spend your time enjoying the water, rather than standing in lines. And what may be the greatest feature of all, is that all attractions will have conveyor belts that bring the rafts to the top for you! Finally we won’t have to carry heavy rafts up countless stairs! Now that’s an innovation I can get behind! Volcano Bay is scheduled to open May 25, 2017 and tickets are already available with purchase of a Universal multi-day pass. Other ticketing options are expected to become available shortly. In addition to all these great officially announced projects, there’s lots of rumors or unannounced things we’re looking forward to in 2017. 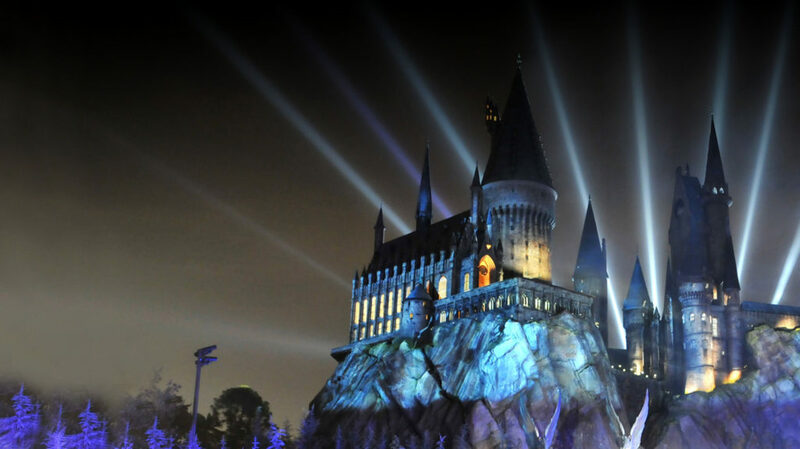 Very recently there’s been a strong rumor going around that a nighttime show might be coming to The Wizarding World of Harry Potter Hogsmeade in Universal’s Islands of Adventure. This nightly show would occur randomly throughout the evening and include projection mapping on Hogwarts Castle accompanied by lighting effects and perhaps small fireworks. This type of performance has already occurred with the grand opening celebrations for Hogsmeade both here and in Hollywood so they already have the technology. Trees have been cut down in front of the castle, most likely to install projectors and lighting, further strengthening the rumor. 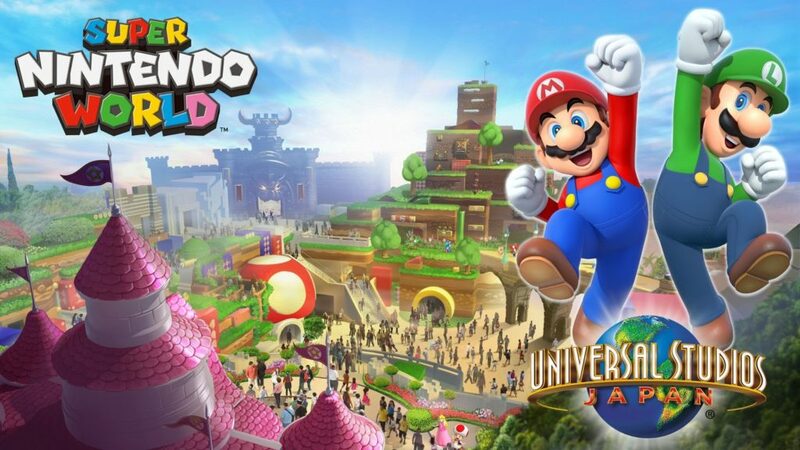 Hopefully 2017 will see an official announcement of Super Nintendo World coming to Universal Orlando. There was already an announcement for the new land in Universal Japan, scheduled to open in time for the 2020 Summer Olympics in Tokyo. Nintendo World is expected to open a year later for Hollywood and maybe even later for Orlando. 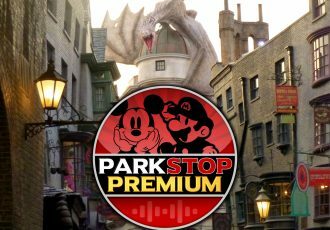 We’re on the edge of our seats waiting to hear the exact dates, and even better, an official announcement on what attractions we can expect to see included. What do you think of the new theme park offerings for 2017 in Central Florida? And what was your favorite additions from 2016? Some of the big things from last year included Skull Island, Frozen Ever After, Toothsome Chocolate Emporium, Disney Springs Shopping District, Nighttime Safari and Tree of Life Nighttime Awakenings at Animal Kingdom, Mako hyper coaster, Cobra’s Curse, and much more! What a great time for Orlando theme park additions!